Manila (AFP) – The Philippines Tuesday hailed the retention of duty-free privileges for most of its exports to the European Union despite concerns over alleged “extrajudicial killings” in President Rodrigo Duterte’s war on drugs. The European Commission announced on Monday that Philippine shipments worth an estimated 120 billion pesos ($2.35 billion), about 66 percent of annual exports to its number-two trading partner, would carry no duties. The decision followed a fraught review in which the Europeans raised the issue of Duterte’s anti-crime crackdown. This has left nearly 4,000 drug suspects dead and drawn criticism from human rights monitors that he was mounting a crime against humanity. “We are elated that GSP (Generalised Scheme of Preferences)+ was retained,” Duterte spokesman Harry Roque told AFP on Tuesday. The GSP+ review, held every two years, hinged on Philippine compliance with its obligations under 27 international conventions, including on human rights. The duty-free privileges covered 1.67 billion euros’ worth of Philippine exports to the EU in 2016, the commission said. The commission concluded Monday that the Philippines had made progress on labour rights, environmental protection, gender equality, people trafficking, health, education, social-economic rights and the fight against corruption, an EU statement said. 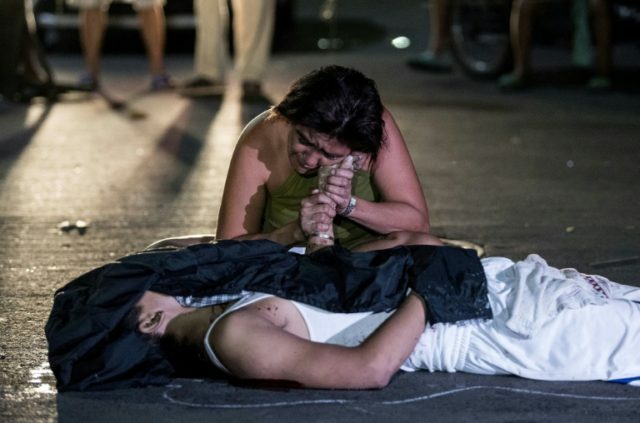 Philippine authorities said Monday they had killed 3,987 suspects in anti-drug operations since Duterte came to power in mid-2016. An unspecified number of people had also been killed by unknown suspects in 2,235 “drug-related incidents” that are being investigated by the police. Duterte has also asked Congress to reimpose the death penalty, preferably by hanging, and to lower the minimum age of suspects who can be prosecuted for crimes. Congress has suggested anyone aged nine or older should be prosecuted for violating laws. Duterte is sensitive to foreign criticism of his crackdown, calling then-US President Barack Obama a “son of a whore” in 2016 and threatening to expel European ambassadors last year. Last year the EU delegation in Manila also announced that the Duterte government had formally made it known it would no longer accept new grants from the EU because of its criticism of the crackdown.